The process of vulnerability disclosure can be riddled with frustrations, concerns about ethics, and communication failure. I have had tons of bugs go well. I have had tons of bugs go poorly. 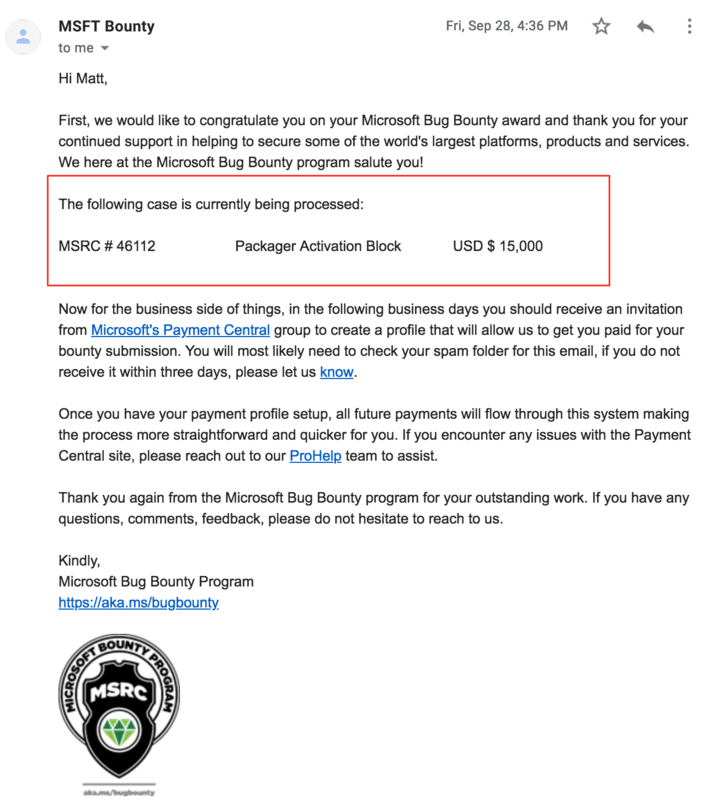 I submit a lot of bugs, through both bounty programs (Bugcrowd/HackerOne) and direct reporting lines (Microsoft). I’m not here to discuss ethics. I’m not here to provide a solution to the great “vulnerability disclosure” debate. I am simply here to share one experience that really stood out to me, and I hope it causes some reflection on the reporting processes for all vendors going forward. First, I’d like to give a little background on myself and my relationship with vulnerability research. I’m not an experienced reverse engineer. I’m not a full-time developer. Do I know C/C++ well? No. I’m relatively new to the industry (3 years in). I give up my free time to do research and close my knowledge gaps. I don’t find crazy kernel memory leaks, rather, I find often overlooked user-mode logic bugs (DACL overwrite bugs, anyone?). Most importantly, I do vulnerability research (VR) as a hobby in order to learn technical concepts I’m interested in that don’t necessarily apply directly to my day job. While limited, my experience in VR comes with the same pains that everyone else has. Factors that you can’t control can start to cause frustration when they occur repeatedly. This is where the vendor needs to be open to feedback regarding their processes, and where researchers need to be open to feedback regarding their reports. This situation is a good example where researchers need to be open to feedback. 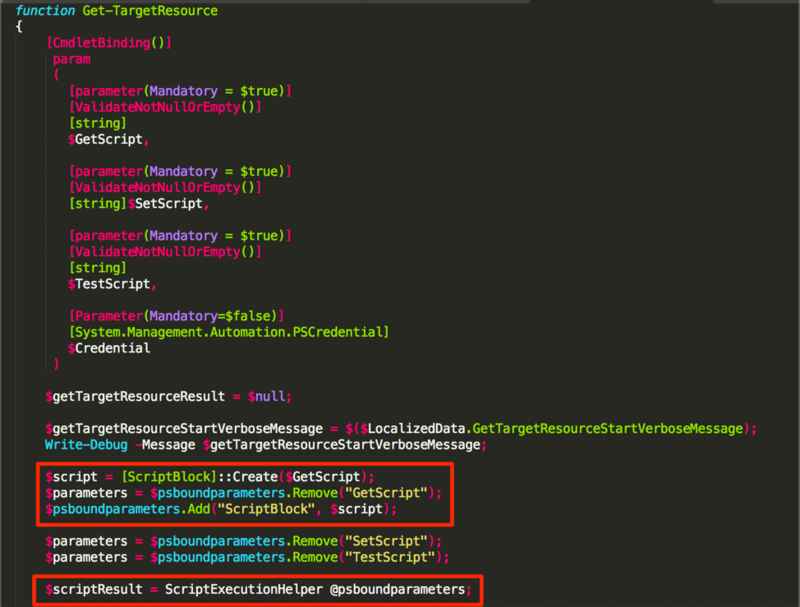 Looking back on my original submission, I framed the bug mostly around Office 2016’s OLE block list and a bypass of the Attack Surface Reduction Rules in Windows Defender. 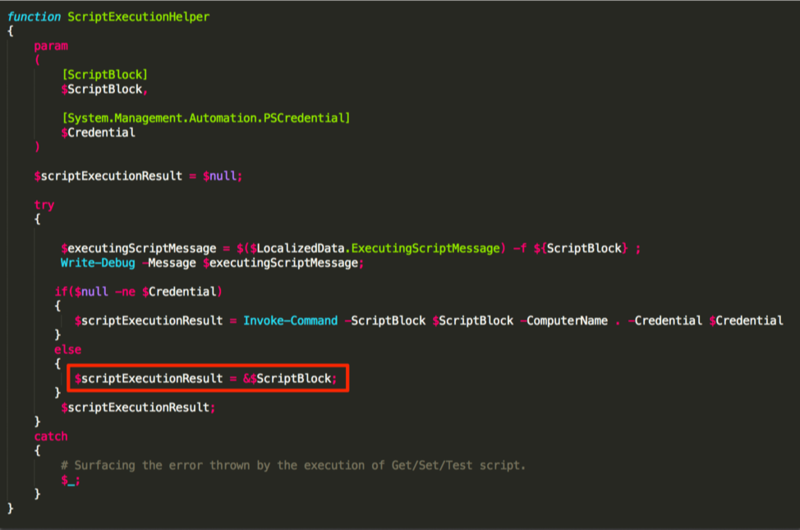 I did, however, mention in the email that “The PoC zip contains the weaponized .settingcontent-ms file (which enables code-execution from the internet with no security warnings for the user)”. This is a very important line, but it was overshadowed by the rest of the email. Awesome! This means that they were able to take my write-up with PoC and confirm its validity. At this very point, a lot of researchers see frustration. 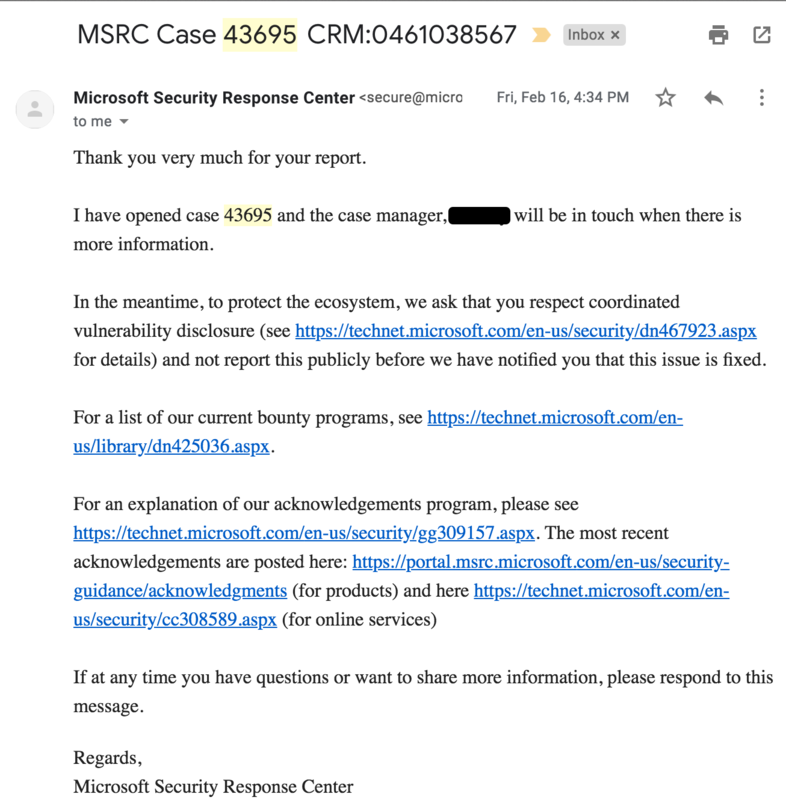 You take the time to find a bug, you take the time to report it, you get almost immediate responses from the vendor, and once they reproduce it, things go quiet. This is understandable since they are likely working on doing root cause analysis on the issue. 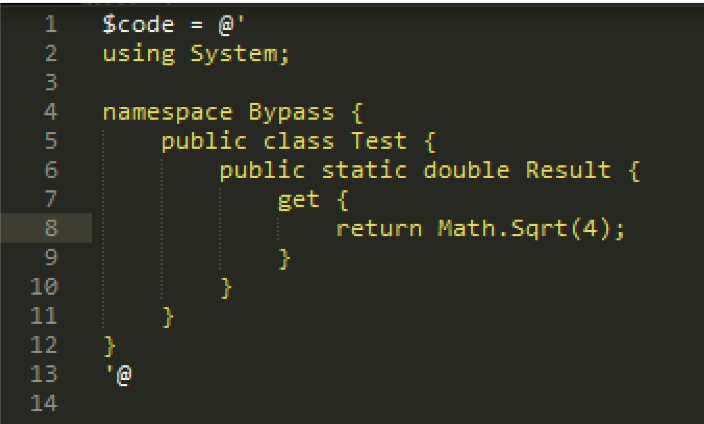 This is the critical point in which it will be determined if the bug is worth fixing or not. I will admit, I generally adhere to the 90 day policy that Google Project Zero uses. I do not work for GPZ, and I don’t get paid to find bugs (or manage multiple reports). I tend to be lenient if the communication is there. 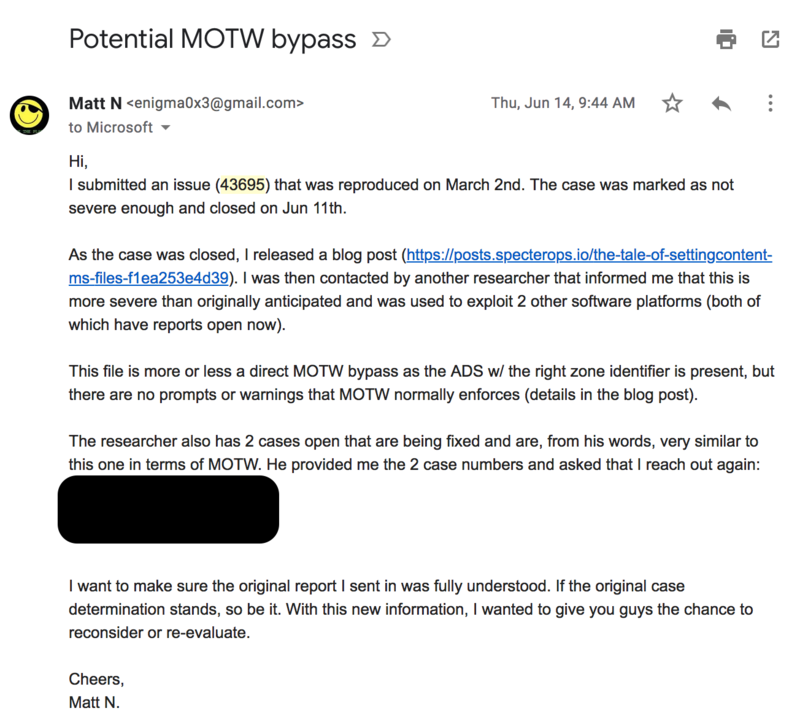 If a vendor doesn’t communicate with me, I drop a blog post the day after the 90 days window closes. Vendors, PLEASE COMMUNICATE TO YOUR RESEARCHERS! Interesting…I all of the sudden have someone else handling my case? I can understand this as Microsoft is a huge organization with various people handling the massive load of reports they get each day. Maybe my case handler got swamped? Let’s pause and evaluate things thus far: I reported a bug. This bug was assigned a case number. I was told they reproduced the issue, then I hear nothing for a month and a half. After reaching out, I find out the case was re-assigned. Why? Vendors, this is what causes frustration. Researchers feel like they are being dragged along and kept in the dark. Communication is key if you don’t want 0days to end up on Twitter. In reality, a lot of us sacrifice personal time to find bugs in your products. If people feel like they don’t matter or are placed on the backburner, they are less likely to report bugs to you and more likely to sell them or drop them online. Ok, so my case was re-assigned on April 25th, 2018 at 12:42 pm. I say “Thanks! !” a few days later and let the case sit while they work the bug. Okay. So, let’s take this from the top. On Feb 16, 2018, I reported a bug. After the typical process of opening a case and verifying the issue, I randomly get re-assigned a case handler after not hearing back for a while. Then, after waiting some time, I still don’t hear anything. 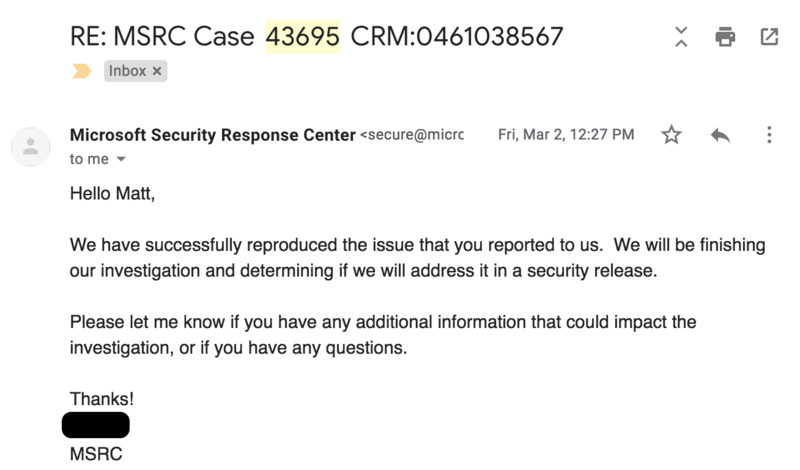 So, I follow up and get a “won’t fix” response a full 111 days after the initial report. I’ll be the first to admit that I don’t mind blogging about something once a case is closed. After all, if the vendor doesn’t care to fix it, then the world should know about it, in my opinion. I have to give it to Microsoft for making things right. 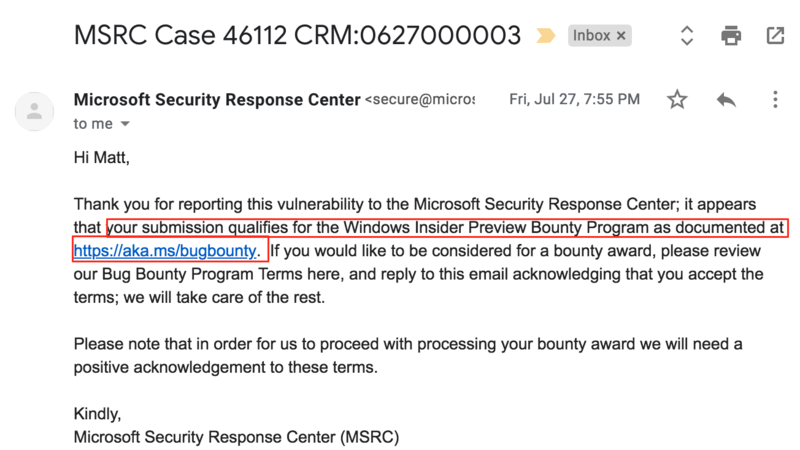 This bug report went from “won’t fix” to a CVE, public acknowledgement and a $15,000 bounty pretty quickly. 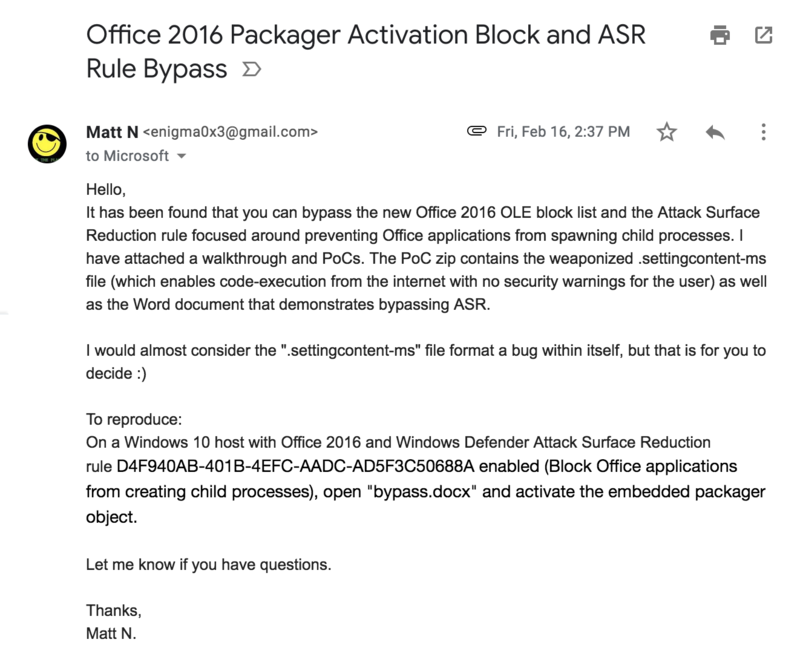 As someone who likes to critique myself, I can’t help but acknowledge that the original report was mostly focused on Office 2016 OLE and Windows Defender ASR, neither of which are serviceable bugs (though, RCE was mentioned). How could I have done better, and what did I learn? If you have a bug, demonstrate the most damage it can do. I can’t place all the fault on myself, though. 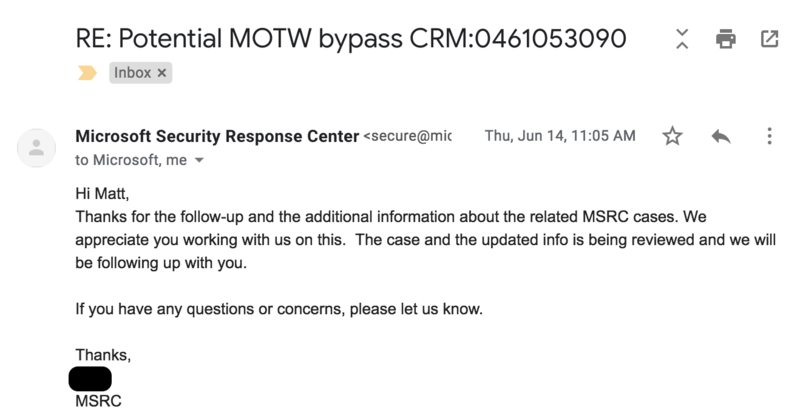 While I may have communicated the *context* of the bug incorrectly, MSRC’s triage and product teams should have caught the implications in the original report, especially since I mentioned “which enables code-execution from the internet with no security warnings for the user”. This brings me to my next point. We are all human beings. I made a mistake in not clearly communicating the impact/context of my bug. MSRC made a mistake in the assessment of the bug. It happens. Vendors: PLEASE COMMUNICATE TO YOUR RESEARCHERS. This is the largest issue I have with vulnerability disclosure. This doesn’t just apply to Microsoft, this applies to every vendor. If you leave a researcher in the dark, without any sort of proactive response (or an actual response), your bugs will end up in the last place you want them. If you think your bug was misdiagnosed, see it through by following up and stating your case. Can any additional information be provided that might be useful? If you get a bug that is issued a “won’t fix”, and then you see it being exploited left and right, let the vendor know. This information could change the game for both you and their customers. 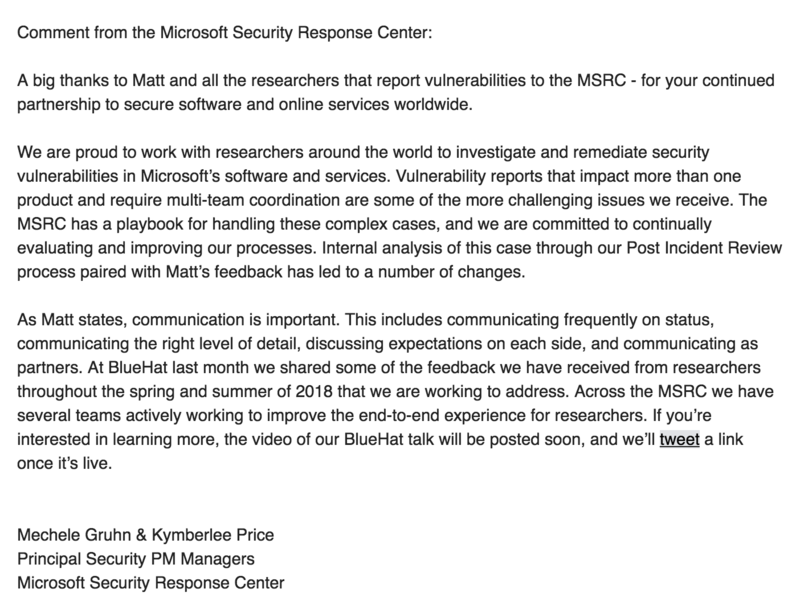 Vulnerability disclosure is, and will continue to be, a hard problem. Why? Because there are vendors out there that will not do right by their researchers. I am sitting on 0days in products due to a hostile relationship with “VendorX” (not Microsoft, to be clear). I also send literally anything I think might remotely resemble a bug to other vendors, because they do right by me. At the end of the day, treat people the way you would like to be treated. This applied to both the vendors and the researchers. We are all in this to make things better. Stop adding roadblocks. 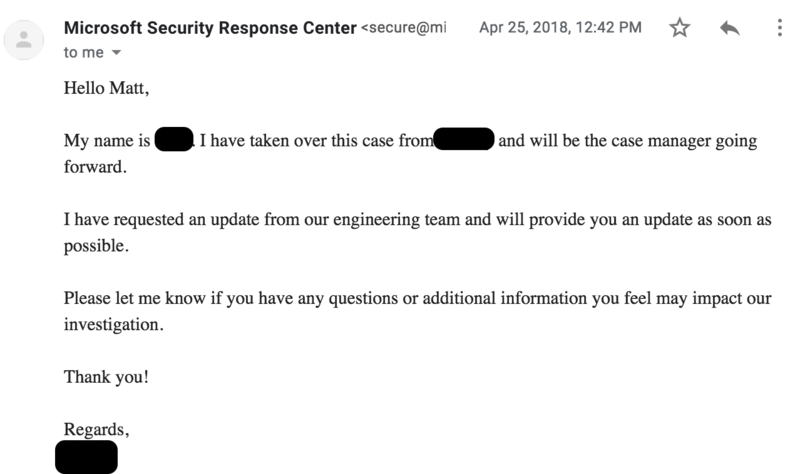 April 25, 2018 at 12:42 PM EDT: Case was reassigned to another case handler. 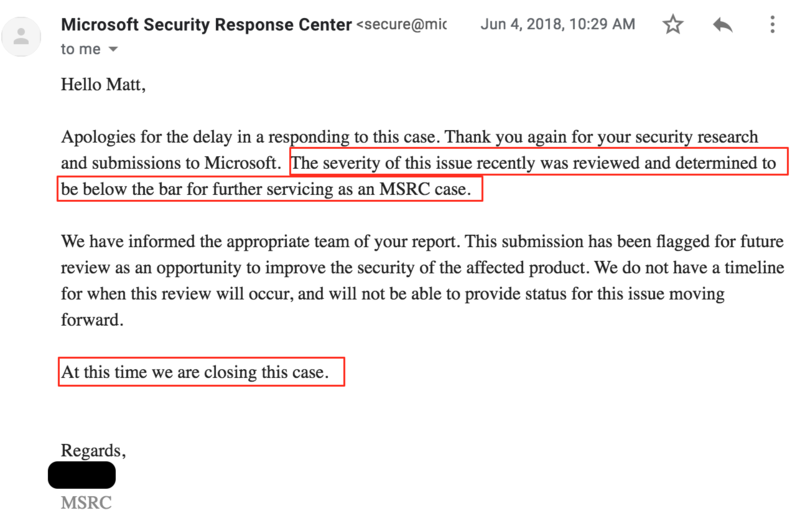 June 4, 2018 at 10:29 AM EDT: Informed the issue was below the bar for servicing; case closed. 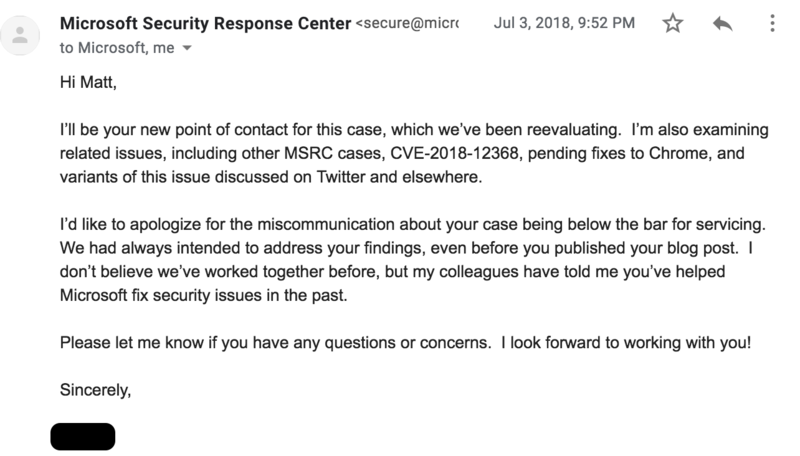 Jul 23, 2018 at 4:49 PM EDT: Let MSRC know .settingcontent-ms was being abused in the wild.